IDF-2014 San Francisco: This week at IDF, Supermicro is showing their latest X10 servers featuring a dual-processor Intel Xeon E5-2600 v3 which is based on 22nm process and Haswell microarchitecture. 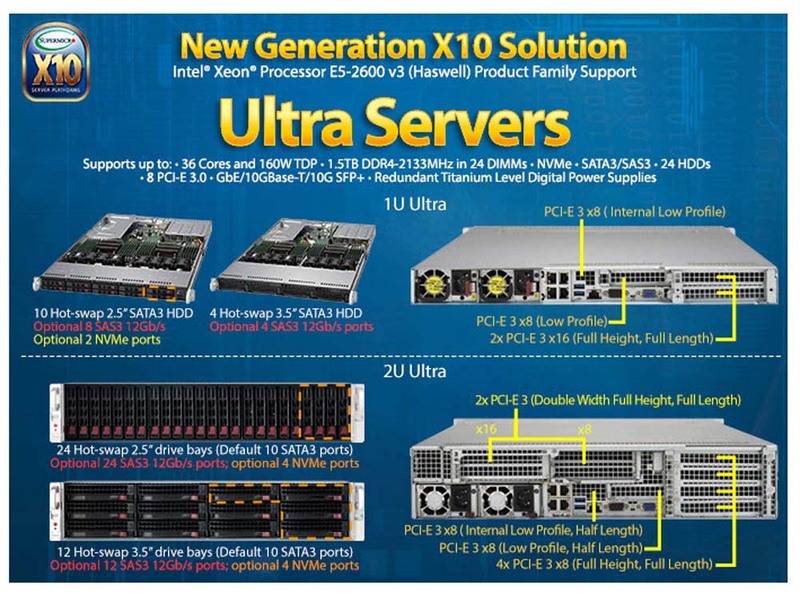 Supermicro’s extensive X10 lineup also includes dual-processor (DP) and uni-processor (UP) solutions available across TwinPro, MicroBlade, FatTwin, SuperBlade, Data Center Optimized (DCO), WIO, Intel Xeon Phi coprocessor, Mainstream, SuperStorage, SuperWorkstation platforms and a wide range of DP/UP motherboards. Supermicro’s Ultra Servers take full advantage of the Intel Xeon processor E5-2600 v3 product family CPUs (160W/Up to 18 Cores). This is the first Intel Xeon processor with DDR4 RAM, which offers memory bus speeds of up to 2,133MHz. The new motherboards can handle up to 1.5TB of memory in 24 DIMMs of Registered ECC memory. The server’s Ultra architecture also supports hot-swappable NVMe storage, 12Gb/s SAS3 with hardware RAID, dual or quad port 1G, 10GBASE-T, 10G SFP+, 40G Ethernet InfiniBand options. Newly developed energy efficient Titanium (96 %+) / Platinum (95 %+) Level power supplies round out the server’s general specifications. Supermicro’s Ultra Enterprise Servers are highly scalable and provide the greatest expansion density of any 1U/2U system on the market today. Supporting up to four Universal I/O (UIO) add-on Cards in 1U chassis and up to eight add-on cards in a 2U, Ultra truly future-proofs purchasers from unforeseen business and data developments. We are looking forward to seeing the SanDisk ULLtraDIMM solid state drive (SSD), the industry’s first enterprise-class, ultra-low latency, memory-channel connected storage solution, in Supermicro’s Intel Xeon Processor E5 Series’ Green SuperServer and SuperStorage platforms. Adding flash storage on the memory bus provides Supermicro servers with a powerful solution to help customers address growing data center application performance requirements without a significant infrastructure investment. Supermicro was founded in 1993 by engineer Charles Liang in San Jose, California. He is still the President and CEO of Supermicro. The company remains the leader in the x86 server industry with their continuous innovations and additional campuses in Taiwan and the Netherlands. The San Jose campus is their R&D Center and high-performance test facility for all their new designs.